A little preface to the baking post this time…To a baker, what could be worse than your stand mixer (in this case a Kitchenaid mixer) developing problems less than a week before Christmas? Oh, perhaps the oven dying, but that’s probably it! And, yep, halfway through the beating of the eggs and brown sugar for this beauty, the balloon whisk began hitting the side of the bowl. Then it hung up completely! I tried adjusting that little screw they tell you to adjust, to no avail. Luckily for me, I have two Kitchenaid mixers, but this larger 6-quart professional is really my go-to anytime I need to beat eggs. So, into the smaller one the nearly beaten eggs went and I really do think I watched them deflate. 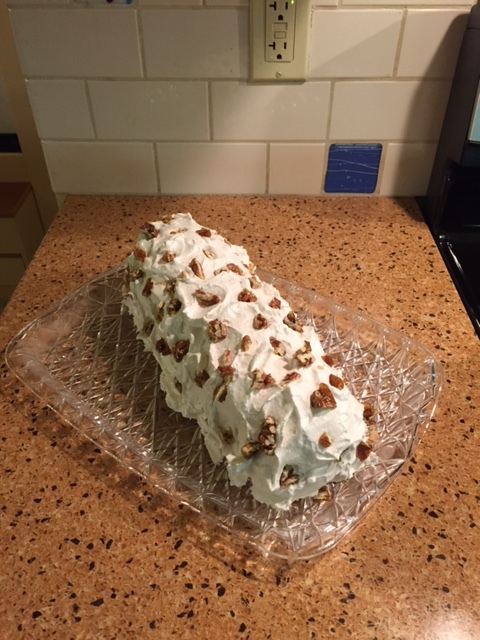 So began my Buche de Noel adventure. I’m really not one to be deterred (I once “workshopped” angel food cake recipes six times in one day in order to bake the perfect angel food cake), so I decided to complete the cake part with these eggs. (I could always make another one, if the cake didn’t turn out, right?) And, I think the cake part turned out “OK,” if a bit flat – but it’s going to be rolled, right? Thank goodness Dorie mentioned that on the initial rolling not to be concerned if the cake cracked, because mine did! I was a little concerned about the filling not having any sugar, but I also believe in “trusting the recipe”. The only change I’d make the next time is to perhaps make a little more filling. I managed to spread filling over the entire cake part, albeit a thin coating – not exactly what I would refer to as “filling”. And then the frosting. Let me begin by saying I love Dorie Greenspan. And, Dorie seems to love Italian meringue – particularly for frostings. I, on the other hand, have a love/hate relationship with these frostings. I love how beautiful they are, that they are light and don’t take away from flavor of the cake, and how much they make! However, I have an almost irrational fear of the whole hot sugar syrup aspect of them. Somewhere in the primitive part of my brain is a little voice that says, “You’re going to burn yourself….” Thus, the hate. And, to finalize my “love affair” with Dorie Greenspan, never have I had recipes that so consistently turn out looking just like Dorie’s pictures! An afterthought: I did watch the video that was posted in julessomeone’s last post. And, it seems that the mixer fiasco I wrote about at the beginning of this post had no bearing on the cake’s outcome. My cake looked remarkably like the one that Dorie and Melissa flipped out of the baking sheet – for some reason, I thought it was supposed to be a puffier cake! With those rules in mind, I’ll probably make this recipe again. I loved working with the dough and I loved the flavor of the dough. Since I’m not a big fan of dried fruit, next time I’ll skip the dried fruit. I’m sure that on some level this is heresy for rugelach, but I really get no pleasure from it. I’ll double the melted butter and cinnamon sugar mixture or, better yet, substitute a nice jam or marmalade. Hey, that could be the fruit part, right? Loved the nuts, coconut and chocolate. I did have a few mini-chocolate chips that I used as part of the chopped chocolate and those worked very well. They may not be the highest quality chocolate, but they were pretty darned tasty in these. I froze them overnight (full disclosure – I was going to bake them after dinner last night but shared a bottle of wine with the husband referenced above and lost all ambition!). I did have a tough time slicing them – the roll kept falling apart. But, I only baked half the recipe – I still have two rolls in the freezer. I’ll try them later and see if I have more success. Oh, and the pesky little things kept falling over in the oven – but that’s not a deal breaker. Hmmm…it just occurs to me that a spread of orange marmalade sprinkled with nuts and chocolate chips could be a Christmas Eve delight!